Evaline Stoker and Mina Holmes never meant to get into the family business. But when you're the sister of Bram and the niece of Sherlock, vampire hunting and mystery solving are in your blood. And so, when two society girls go missing, there's no one more qualified to investigate. 5 Words: Sherlock Holmes, Time Travel, Steampunk. So this was a bit of a surprise for me. For one, it absolutely flew by. It ended and I was actually surprised because despite everything wrapping up quite nicely, I was prepared for more. Jayne Entwistle does a fabulous job of reading this. The next book in the series is on my audible wishlist and so are a few of her other readings. I liked the distinct voices. Even if I wasn't paying attention to the beginning of the chapter, where it told you who the narrator was, I was never lost. It wasn't just the voices that the actress was giving the characters were different, it's that the characters themselves were so distinct. 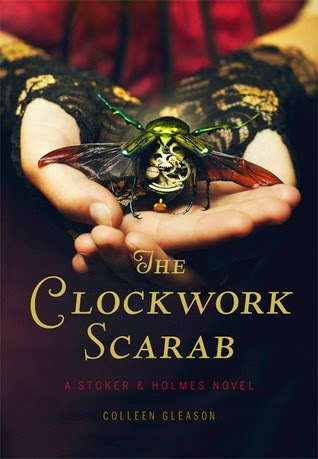 This plays on Sherlock canon, adds a dash of Steampunk and a touch of time-travel, picks up some Bram Stoker on the way and then runs madly into the wild, flailing its arms around hoping to pick up some ancient Egyptian lore. And it's excellent. This sounds very interesting. I might have to add it to my audible wish list.